The growing global demand for food, feed and bio-based renewable material is changing the conditions for agricultural production worldwide. At the same time, revolutionary achievements in the field of biosciences are contributing to a transition whereby bio-based alternatives for energy and materials are becoming more competitive. 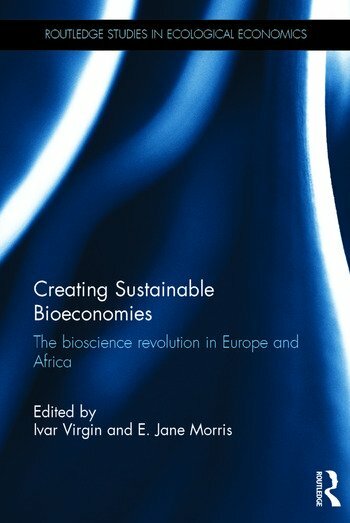 Creating Sustainable Bioeconomies explores the prospects for biosciences and how its innovation has the potential to help countries in the North (Europe) and the South (Africa) to move towards resource efficient agriculture and sustainable bioeconomies. Throughout the book, the situations of Europe and Sub-Saharan Africa will be compared and contrasted, and opportunities for mutual learning and collaboration are explored. The chapters have been written by high profile authors and deal with a wide range of issues affecting the development of bioeconomies on both continents. This book compares and contrasts the situations of these two regions as they endeavour to develop knowledge based bioeconomies. This volume is suitable for those who are interested in ecological economics, development economics and environmental economics. It also provides action plans assisting policy-makers in both areas to support the transition to knowledge based and sustainable bioeconomies. Section 1. Introduction: Why this book? Joachim von Braun, Chair of the German Government’s Bioeconomy Council. Ivar Virgin, Matthew Fielding, Melinda Fones Sundell, Holger Hoff and Jakob Granit Stockholm Environment Institute. Chapter 3. The gene revolution: What can and can’t be done with modern biosciences? E. Jane Morris, University of Leeds, UK. Section 3- Towards resource efficient economies Broadening the base of agriculture. Olle Olsson1, Torbjörn Fagerström2, Jens Sundström2, Thomas Kätterer2 and Ivar Virgin1. 1Stockholm Environment Institute. 2Swedish University of Agricultural Sciences. Chapter 8. The European Perspective. A renewable resource base for the European Chemical industry: Getting to a European bioeconomy. Ivar Virgin, SEI and Allan Liavoga, ILRI BioInnovate coordinator. Dirk Carrez, Clever Consult, Belgium. Chapter 18. Intellectual Property challenges for a bioeconomy. Ivar Virgin is a researcher at the Stockholm Environment Institute (SEI), Sweden. For the past 20 years at SEI he has done extensive research, managed numerous projects and published extensively in the field of bioscience innovation. A focus of his work has been capacity building and institutional building in third world countries, particularly Africa. E. Jane Morris is an independent Life Sciences consultant who has spent most of her working life in Africa. She is now based in the UK and has a Visiting Fellowship in the School of Biology at Leeds University. She has expertise that includes bioscience and biotechnology, GMO biosafety and regulatory issues and strategy planning.